Ms. Vance discussed notable cases and decisions, pointing out that anesthesia-related claims are one of the top 10 by severity. Dr. Rothfield, who is a member of PPAHS’s board of advisors, spoke about four areas of concern in anesthesia delivery - failure-to-rescue, airway injuries, ambulatory and office-based anesthesia, and obstetric anesthesia. In his discussion of failure-to-rescue, Dr. Rothfield focused on the most vulnerable patients, particularly obstructive sleep apnea patients and postoperative patients. 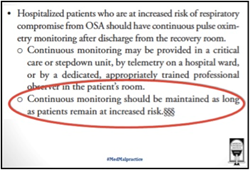 Citing ASA Sleep Apnea Guidelines, he emphasized the need for continuous electronic monitoring with pulse oximetry for oxygenation and with capnography for adequacy of ventilation. Before speaking about how hospitals may save money through improved care, Mr. Wong spoke of the need to never believe that patients’ lives can be adequately compensated by dollars. He then discussed the case of Wesley Medical Center in Wichita, Kansas, which utilized the continuous monitoring discussed by Dr. Rothfield. Wesley Medical Center was able to shift the severity of adverse events related to opioid use for pain management. Per 100 adverse events, such a shift would on average save more than $3.5 million. Copies of the presentations made at the conference may be obtained at by going to the conference resources page by clicking here. To view the presentation on “The Dangers of Anesthesia” by Ms. Vance, Dr. Rothfield, and Mr. Wong, please click here.